Cipflox (Ciprofloxacin Hydrochloride) is a quinolone antibiotic, which is used to treat a wide range of bacterial infections. Doctors and medical experts consider it especially effective when used to treat infections caused by gram-negative bacteria. 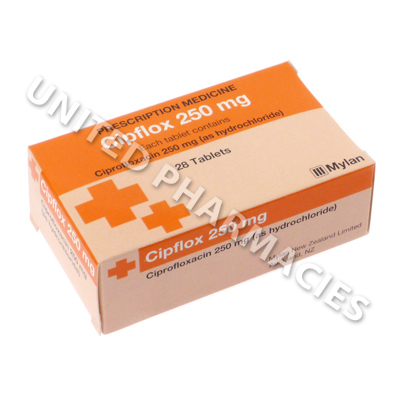 Cipflox (Ciprofloxacin Hydrochloride) is a quinolone antibiotic, which is used to treat a wide range of bacterial infections. Doctors and medical experts consider it especially effective when used to treat infections caused by gram-negative bacteria. Conditions commonly treated with this medicine include respiratory tract infections such as pneumonia, skin infections, prostatitis (a bacterial infection of the prostate), eye infections, ear infections, gonorrhoea and many other types of infections caused by bacteria. It is important to note that it will not work for viral infections. 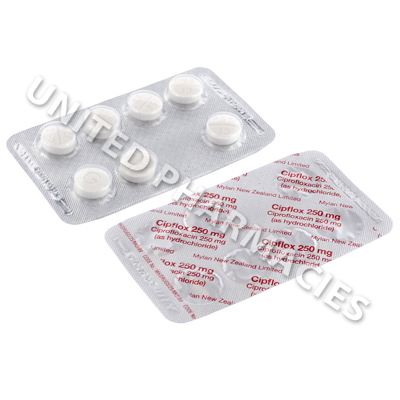 Cipflox (Ciprofloxacin Hydrochloride) tablets are taken by mouth. This medicine is prescribed for treating a very wide range of infections, and because of this, the individual dosage will vary from patient to patient, depending on various factors, such as the specific condition being treated, the severity of the infection and the patient's medical history. A full medical examination is required, so that the prescribing doctor can determine a suitable dosage regimen. Patients treating a urinary tract infection are sometimes told to take 250mg every 12 hours, with treatment lasting for 3 days. Other conditions require different doses, and you must follow your doctor's instructions. Inform the prescribing doctor of any side effects which occur. Although it is considered by most doctors to be less common, there is a slight chance that severe reactions will occur. You must immediately see your doctor if you notice bloody diarrhoea, seizures, symptoms of disorders affecting the liver or kidneys, fever, appetite loss or any other serious side effects. Tendon damage can occur in some patients after taking this drug, however, it is considered to be rare. Certain patients are considered to be at greater risk of this occurring, such as those who are over 60, patients who are being treated with corticosteroids, or those who have previously undergone an organ transplant. Patients who suffer from myasthenia gravis should not take this medicine, as it could worsen their condition. Always use Cipflox (Ciprofloxacin Hydrochloride) as you have been prescribed by your doctor. Never self-medicate or change your dosage without first consulting your doctor. The correct dosage can vary depending on your health, medical history, and the severity of the condition being treated.